Fat cat is a political term originally describing a rich political donor, also called an angel or big money man. The New York Times has described fat cats as symbols of "a deeply corrupt campaign finance system riddled with loopholes", with Americans seeing them as recipients of the "perks of power", but able to "buy access, influence policy and even veto appointments." It is also commonly used to describe a rich, greedy person who, due to ownership of large amounts of capital, is able to "live easy" off the work of others. In the United Kingdom, it is also used to refer to executives whose pay is deemed by others to be excessive. 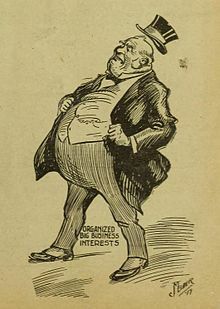 1917 caricature of "Organized Big Business Interests"
The word was first used in the 1920s in the United States to describe rich political donors. The 1960 campaign for the Democratic nomination to the presidency was marked by competition between fellow Senators Hubert Humphrey and John F. Kennedy. Their first meeting was in the Wisconsin primary, where Kennedy's well-organized and well-funded campaign defeated Humphrey's energetic but poorly funded effort. Humphrey objected to the media, "The Kennedy forces are waging a psychological blitz that I cannot match. I'm not the candidate of the fat cats....". A 1972 book by sociologist G. William Domhoff, titled Fat Cats and Democrats, contrasted the Democratic Party's perceived populism with its funding structure. In Domhoff's view, "Short of a nationwide system of public financing for candidates ... it seems likely that wealthy fat cats will find one way or another to finance the candidates of their choice." The campaign finance reforms following the Watergate scandal greatly reduced the amount of money that individuals could contribute to a political campaign. In the words of Ben J. Wattenberg, "The fat cats were driven from the temple...."
During a 1997 $1,000-per-plate dinner at the Hilton Washington for the Republican Party, which The New York Times dubbed "a lucrative display of the resilience of big-money campaign fund-raising", street protesters calling for further reform dressed in "fat cat" costumes and chanted "Hey, hey, ho, ho! Corporate fat cats like Tim Gerlach have to go!" In the 2008 Democratic race, a group of wealthy backers of Sen. Hillary Clinton wrote to Speaker of the House Nancy Pelosi, warning her they might withdraw financial support for the Democratic Congressional Campaign Committee if Pelosi did not change her position on whether the party's superdelegates "should support the party's pledged delegate leader". According to the Center for Responsive Politics, the signers included donors such as Haim Saban and Robert L. Johnson, and had given the party nearly $24 million since 2000. In response, the grassroots liberal political action committee MoveOn called the move "the worst kind of insider politics -- billionaires bullying our elected leaders into ignoring the will of the voters," but reassured members that "when we all pool our resources, together we're stronger than the fat cats." The word has since acquired a meaning of a rich, powerful person of possibly 'undeserved' wealth. It is now commonly used in editorial cartoons. 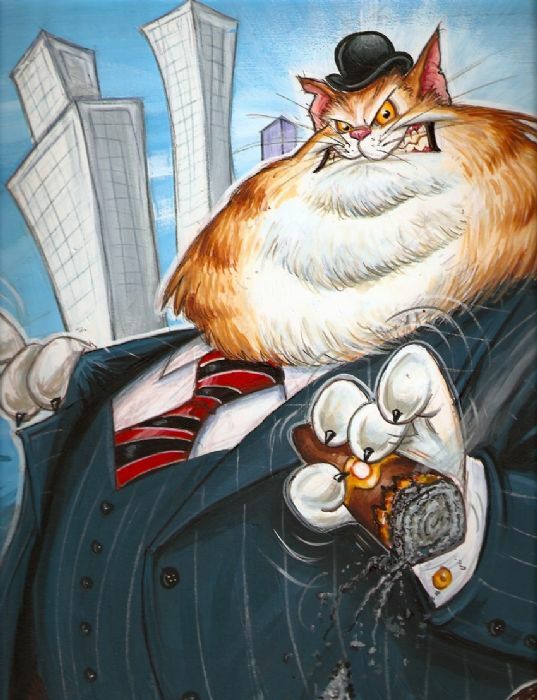 In the British printed media, a fat cat is usually depicted as a cat-faced, corpulent, middle-aged man clad in a pin striped suit and holding or smoking a thick cigar, representing a venal banker or a high earner executive or "captain of industry". James Brown's 1973 song "Down and Out in New York City" includes the lyrics "All the fat cats, in the bad hats". ^ "Of Fat Cats and Other Angels". Time. November 29, 1971. Retrieved 2008-03-31. ^ Richard L. Berke (February 17, 2002). "Money Talks; Don't Discount the Fat Cats". The New York Times. Retrieved 2008-03-31. ^ "Fat cats feeding". The Economist. 2003-10-09. ^ "Scratching the First Teflon Presidency: Frank Kent vs. Franklin Roosevelt". United States Department of Education. Retrieved 2008-04-06. ^ David G. Farber (2002). Sloan Rules: Alfred P. Sloan and the Triumph of General Motors. University of Chicago Press. ISBN 0-226-23804-0. ^ Kent, Frank W. (1928). "Fat Cats and Free Rides". American Mercury. XIV (54): 129–132. Retrieved 2019-03-23. ^ "Plenty of Jack". TIME. March 28, 1960. Retrieved 2008-04-06. ^ G. William Domhoff (March 2005). "Third Parties Don't Work: Why and How Egalitarians Should Transform the Democratic Party". Retrieved 2008-04-05. ^ Jean Hardisty (1999). Mobilizing Resentment: Conservative Resurgence from the John Birch Society to the Promise Keepers. Wilma P. Mankiller. Beacon Press. ISBN 0-8070-4317-6. ^ Ben J. Wattenberg (1984). The Good News is the Bad News is Wrong. Simon & Schuster. ISBN 0-671-60641-7. ^ Francis X. Clines (May 14, 1997). "A Dining-for-Dollars Gala Fattens the G.O.P. 's Coffers". The New York Times. Retrieved 2008-04-06. ^ a b Rebecca Sinderbrand (March 27, 2008). "MoveOn takes on Clinton's moneyed supporters". CNN.com. Retrieved 2008-04-06. ^ Lindsay Renick Mayer (March 27, 2008). "Democratic Donors Send $24 Million Letter to Pelosi". Public Eye. Center for Responsive Politics. Archived from the original on 2008-03-31. Retrieved 2008-04-06. ^ Bell, Steve (27 July 2002). 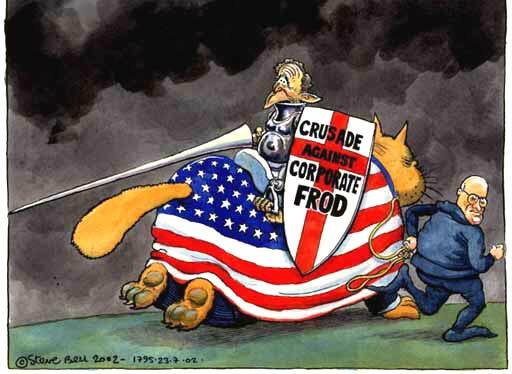 "The crusade against the corporate frod". The Guardian. Retrieved 12 October 2015. Look up fat cat in Wiktionary, the free dictionary. A Cigar smoking "Fat Cat"